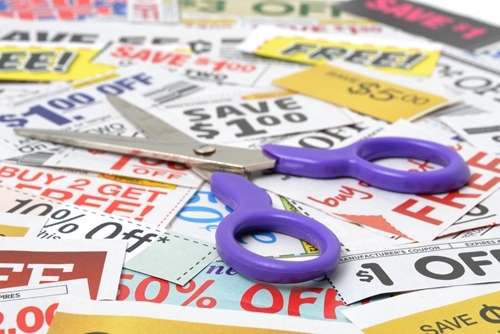 Cutting coupons has gone from a simple process done before grocery shopping to a lifestyle. Just look for examples on the TLC show “Extreme Couponing” or the numerous blogs dedicated to the art of cutting out coupons. Those pieces of paper made popular by the budget conscious are not only beneficial for customers, but also for marketing professionals. Coupons are a traditional marketing tool that are used to notify customers about potential savings and increase sales. The right discount can influence a person to purchase an item he or she wasn’t initially intending to buy. The popular marketing tool was used by a large number of people in the U.S. during 2000, but usage has since decreased a bit. According to the Promotion Marketing Association Coupon Council, marketers distributed more than 330 billion coupons during 2000 – an increase of 7.5 percent from the previous year. Of those coupons, about 4.5 billion coupons were redeemed. Marketers can use the power of coupons to boost brand recognition and increase sales by notifying customers of a potential deal. Coupons slightly lost their luster in 2012 after experiencing a resurgence during the Great Recession. The News Observer reported that the Association of Coupon Professionals has stated that coupon use decreased by 17 percent during 2012 in a year-over-year comparison. September is National Coupon Month and a business can celebrate by using coupons and promotional marketing products to boost the success of a campaign. A company can create an integrated marketing campaign that capitalizes on the strengths of both tools to bolster sales and improve brand recognition. According to the Promotion Marketing Association’s Coupon Council, 89 percent of the population uses coupons during the course of the year. By using coupons and items like promotional pens or tote bags, a company can gain a loyal customer. Impressive displays like handing out coupons and free swag is an ideal way to communicate to the budget-conscious American consumer.